Inside the room with the college football luminaries who determine the playoff is a quiet crew of staffers who make the all-important rankings run smoothly. 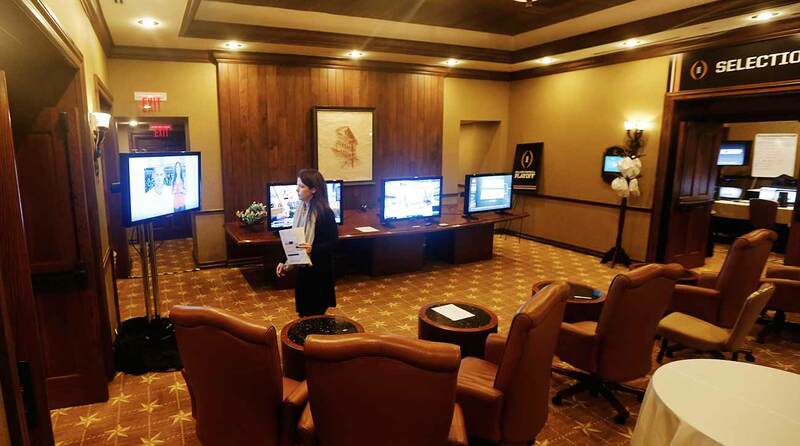 GRAPEVINE, Texas — In preparation for the inaugural meeting of the College Football Playoff selection committee, Allison Doughty went on a mission. She wanted to make sure the committee’s meeting location, a board room overlooking the atrium at the Gaylord Texan Resort, was secure. After all, when it hosts the committee members’ deliberations, the room includes a giant projection screen and two flat-screen monitors that display the rankings and other pivotal information. Could people in the atrium see through the floor-to-ceiling windows for an inside peek at college football’s most secretive process? The guest balconies directly across the atrium on the third floor were a concern, too. So she did some location scouting. Casual college football fans probably know Bill Hancock, the executive director of the College Football Playoff since its creation in 2012. They probably recognize the big names on the selection committee (Frank Beamer, Ken Hatfield, Gene Smith) responsible for selecting the participants of the playoff, assembling the final Top 25 and choosing the New Year’s Six bowl pairings. But they almost certainly don’t know Doughty, or the four people who are the only non-committee members with a seat inside the room during the heat of the debate. They call themselves the “flies on the wall”, a quiet crew of CFP employees who make the sport’s preeminent rankings run smoothly. “They are silent observers in there to support,” CFP committee chairman Rob Mullens says. “Everybody has their role, and they’re great at their role.” This is a story about the staffers supporting football’s most powerful committee. There is Doughty, the director of events and hospitality services, who monitors the proceedings from outside the room. There is Wes Gentry, a 37-year-old former Denver Post journalist who is the committee’s IT guy (formally, the director of administration and technology). Next is chief operating officer Andrea Williams, a former Texas A&M two-sport athlete and Big Ten administrator who left her job as the Big Sky Conference commissioner to be Hancock’s right-hand woman. Senior director of operations and logistics Laila Brock is the very first person to learn the playoff participants because she controls the voting tabulation computer in the committee room (when they pop onto her screen, she says her heart begins to pound “out of my chest”). 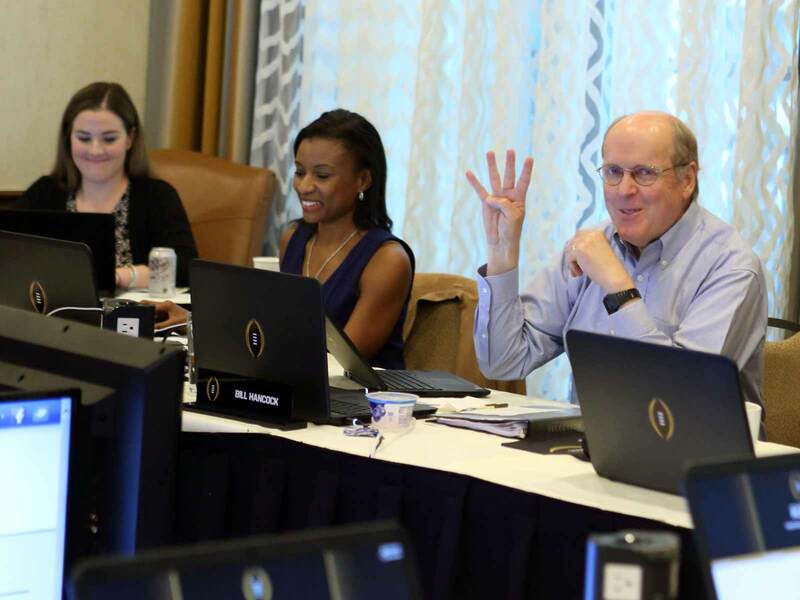 As the committee’s communications arm, Gina Lehe is in charge of sending the email revealing the final four for the first time to ESPN producers—but not before reading over the list “900 times,” she says. Committee members and staffers kick off their busiest and most important stretch of the year this week. They’ll meet after each of the final six weekends of the season to produce a new Top 25, with the first one released on Tuesday night on ESPN and the final rankings and playoff participants revealed on Sunday, Dec. 2, on what’s known here as Selection Weekend. For the five CFP staffers, Selection Weekend is a pressure-packed scene, and Lehe might have the most significant role. As part of the agreement with ESPN, the CFP allows the network to announce the playoff teams in a live show that Sunday. Lehe sends the email about 45 minutes before that show, at 10:45 a.m. CT. “I’m very nervous every week. I look it over and over and over again,” she says. Hancock estimates that only about 20 people—committee members, staffers and ESPN producers—know the playoff teams before they flash onto the screen. The ESPN producers don’t even share the results with on-air talent like Rece Davis and Kirk Herbstreit. There has not been a leak in the system’s first four years. CFP executive director Bill Hancock sits next to Laila Brock during a committee meeting. In the background to the left is Gina Lehe’s corner desk. A replacement sits in her seat. She was delivering her second daughter at the time of this meeting. Inside the room, Lehe sits at a desk in the corner, controlling the projector and two flat-screen monitors to provide visual aides for committee members, who are seated at ballroom tables positioned in the shape of a U. Outside the room, Lehe is responsible for all external relations: communications, digital media and branding. Anything with the College Football Playoff logo must be approved by her. Those Dos Equis commercials advertising the playoff with former coaches Steve Spurrier and Les Miles? Lehe saw advanced versions of them months ago. Gentry is the computer troubleshooter in the committee room, seated in a chair along the wall, ready to spring into action whenever any one of the committee members’ laptops or the 14 flat-screen televisions fail. He describes his job outside of the room as “a lot of paper pushing.” Brock facilitates the committee meetings, keeping members on schedule through the voting rounds and reading off the results from the voting tabulation computer. In her rookie year last season, the final playoff results arrived to her monitor—Clemson, Oklahoma, Georgia, Alabama—and she momentarily froze. “I had to take a step back and breathe for a minute, make sure I’m reading them in the right order,” she says, laughing now. Outside of the room, she books talent for the playoff’s public events and handles fan functions at the semifinals and championship games. Williams controls the statistical comparisons that help the committee make its decisions. If members want to compare Ohio State and LSU’s strength of schedule, or consult the box score from a team’s only loss, she pulls that up on the massive flat-screen monitors. She gets a cushy seat, too, right next to the chairman. Outside of the room, she operates the championship game and semifinals, while also managing the bidding process for future title game sits. Locations of the next six CFP championship games are set, and preparations for Indianapolis in 2022 and Los Angeles in 2023 are already underway. That first year was interesting. Resort officials had security officers sprinkled throughout the property, expecting a College GameDay–type atmosphere outside of the board room. “You know, fans everywhere and stuff,” Doughty says, “That didn’t really happen.” In fact, there have only been two fan sightings near the board room. On the first Selection Sunday, a man wearing a Florida State jersey creepily lurking in the hallways of the Gaylord Texan was escorted out of the resort. Another time, a father and son popped in on a mid-season Tuesday night, well after committee members had left. “They randomly wandered up here. ‘Oh, is this the room?’ They looked around and took some pictures,” Doughty says. On committee meeting days, Doughty’s duties go beyond security. She makes sure the hotel hospitality staff keeps a plethora of snacks outside of the board room: bowls of peanut M&Ms, a fridge of ice cream goodies, bags of pretzels and chips, and the most important grub of all, a plate of bacon under a warming lamp just outside the meeting room. “They like crispy bacon,” she says. It is here in this exterior room that Doughty lingers while deliberations go down behind the closed double doors. Committee members are recused from discussions that involve teams in which they are connected, and those members tend to hang out in the bacon room. The staffers and committee members inside the room become friends quickly. After all, they are stuck together, sometimes for 10 hours and multiple days at a time, especially leading up to the final rankings, when all of them are sequestered in the resort and stay in hotel rooms down the hall from the board room. Selection Weekend begins Saturday with committee members and staffers watching conference championship games in one of the offshoot rooms. After games are completed, they gather in the board room for deliberations that have, in the past, lasted until 3 a.m. Sunday, emerging with a full Top 25 before crashing in their suites. “Everyone sleeps on it,” Brock says. Williams is the most recent hire, replacing Michael Kelly, who left to become the athletic director at South Florida over the summer. “I will tell you, when the College Football Playoff got started, I was like, ‘That’s my dream job,’” she says. This week starts the most important six weeks of their year—a “mad rush” to Selection Weekend, as Lehe calls it. They’ll sit quietly in the room, watching and listening intently, in some cases maybe secretly hoping their team squeaks in. Doughty will stock bacon in the lobby, fill bowls of M&Ms and make sure the temperature in the room is just right, a challenge that has become a running joke. Their work manipulating air vents, tabulating top-secret votes, fixing computer issues and sending the most sensitive of emails will take center stage in the next several weeks, even though the appreciation they earn may be hidden behind those white sheer curtains.